Marston’s warehouse is open 24 hours a day, 5 days a week and embraces the very latest technology in design, equipment, automation and supporting systems. Deliveries from UK publishers usually arrive and are on the shelf within 24 hours, but even complicated multi-titled, multi-boxed stock arriving from overseas is unpacked and ready to be sent out within 5 days. And although we guarantee to depatch within a maximum of 5 days from receipt of order, in fact the vast majority of all orders received from the trade go out next day! Hotlines operate at key times of the year, covering the whole of September to December, spanning back-to-school in September, and the lead up to Christmas. When hotlines are in operation, we guarantee to ship same day all hotline orders received by 12 noon. Marston operates a sophisticated Oracle-based warehouse management system from retail industry leader MICROS. 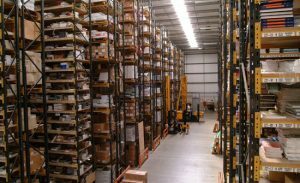 The system allows us to maximise efficiencies at all stages of the warehouse pick, pack and despatch process. Working in real time, the system uses hand-held radio frequency terminals to scan, track, and handle items throughout the warehouse, and this enhances speed and accuracy. With full interface to Vista, it gives the warehouse staff access to detailed title information, ensuring they have complete control and allowing maximum flexibility at any point. Our perpetual inventory system means we always have accurate records of what stock is on hand, and can alert publishers in time to make new stock available. We interface order progress to our order processing system so Customer Services staff can track and report to customers about the exact status of their order, and it is very easy to make changes to such things as delivery instructions. Deliveries are usually made door-to-door, unless the client has a shipper we are required to use, and we prepare all customs, export and other documentation, where necessary. Because we work alongside more than 20 different suppliers to help us deliver to all corners of the world, we are always able to secure quick and efficient delivery globally at cost effective rates. No one likes returns, but they are an integral part of the publishing business and we process them as quickly as we can. We act on behalf of our clients to help keep returns levels low, whilst also ensuring that trade accounts are treated fairly and credited efficiently and in compliance with industry standard principles where they return re-saleable stock. Where required by publishers we return all re-saleable copies to stock for re-sale.